Now of course the title is opinionated and not fact. The next manager that comes in might not share my sentiments, that’s not lost on me. What’s also not lost on me is Osborn’s suitability for the role. Nottingham Forest are in disarray, there’s no denying that, and playing captain, Henri Lansbury joining Aston Villa earlier this week only added to their troubles. In yesterday’s 1-0 home win over Bristol City, experienced centre-back, Matt Mills took the armband. On reflection, it’s hard to deny he was the natural choice. Mills has been a regular feature in the side, knows the league and is very vocal on the pitch. Whether he is in the changing room is another matter, although I’m sure he is. Mills has however been part of and defence which kept their first clean-sheet at the City Ground since March 2016. This isn’t all down to Mills, although he will be the first to admit his form hasn’t matched that of his first season with Forest. He made 42 appearances for the club during the 2015/16 season, adding a helpful 5 goals. Under Phillipe Montanier, the squad was constantly rotated, much to the annoyance of Forest’s huge fan base. Sometimes rotation is necessary, especially as a new manager as you want to see your full squad. Unfortunately for Montanier, he tinkered too much. He did some good things though. He gave first-team starts to academy graduates, Matty Cash and Joe Worrall, both of whom will be hoping to follow in Osborn’s footsteps. This brings me nicely back round to Osborn. 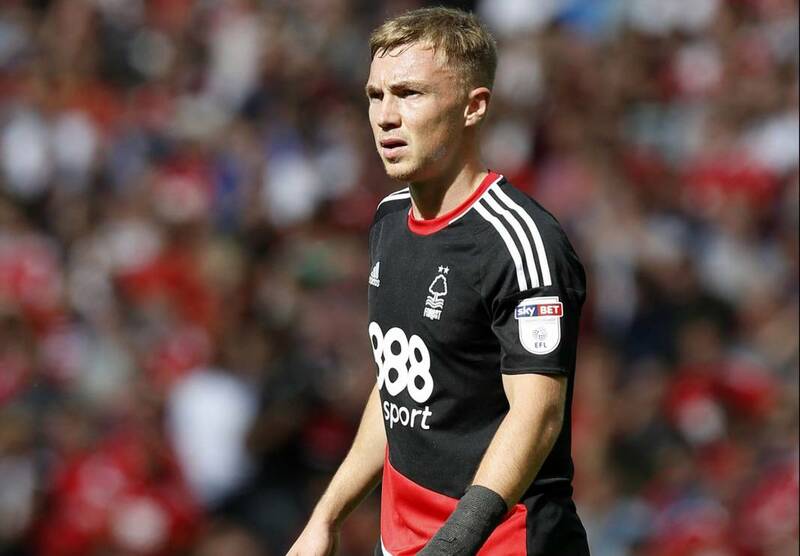 A proud graduate of the ever productive, Nottingham Forest academy , Osborn has since gone on to make over 100 senior appearances for the club. Growing up in Derbyshire, to a family of Derby County fans it must have been hard to transition to Forest – well if it was, he hides it well. After being released by his boyhood club, he joined rivals, Forest at the age of 9 and has not looked back since. In his first season with the under-18’s he was predominantly used as a left-back. He was named Academy Player of the Season that year, which brought his attention to the first team management. Gary Brazil who took over as Careraker Manager back in March 2014 gave Osborn a shot in the first team due to injuries, notably to then first-team left-back, Gonzalo Jara. It was midfield however that Osborn was given his chance to shine and shine he did. He went on to make eight appearances for the first team that season which earned him a new five-year contract. Since then, barring injuries and a small period where Dougie Freedman left him out of the side due to a lack of form, Osborn has been virtually ever-present. Whether Osborn lines up on the left-hand side of midfield, centre-midfield or as a striker, he shows the same commitment. At 5ft 9, and under 12 stone, Osborn isn’t your typical striker, but he has the heart and technical ability to play wherever he is asked. Playing as Britt Assombalonga’s strike-partner against Ipswich Town back in November, Osborn impressed. He didn’t score but he did set up Assombalonga within the first minute of the game, with a perfectly weighted through ball after a mistake from an Ipswich defender and was a genuine nightmare for the defence for much of the game. Basically, Osborn is the perfect team player. No matter the position or role he is asked to play, he plays at 100% every time, full of pride. A captain is meant to lead by example, something Osborn does, a captain is to be relied on, something Osborn can be and a captain is also meant to be vocal, something Osborn is. He is however vocal at the right times. On the field and no doubt the changing room but never in the press. During such difficult times for the club he has not once spoken out of turn, something that should be admired. If Osborn is not captain material I don’t know who is. To make over 100 appearances for the first-team at just 22 years of age is an achievement in itself. To make those with the maturity of a veteran player is an entirely different prospect altogether. When he steps on the field, you know what you’re going to get from Osborn, if nothing else you’re going to get energy. It’s this sort of energy that galvansises a whole team, even during crisis. Look at Osborn’s winner from yesterday’s game v Bristol City and it will prove that he doesn’t only have commitment, energy and heart but also technical ability in abundance.He has come a long way since scoring the 92nd minute winner against rivals (and his boyhood club) Derby back in February 2015. Although he won’t want to be remembered solely for that goal, a goal against Derby is the perfect way to win the hearts of the Forest fan base, something he continues to do. Forest will be desperate to keep hold of the talismanic Osborn and giving him the captain’s armband would be a massive incentive.